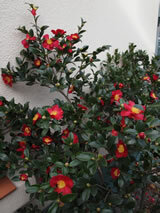 Attractive erect shrub with a slow growing habit. Lustrous leathery dark green leaves. 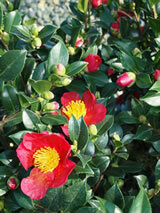 Bright red single flowers with yellow stamens in winter appear along the branches. Very hardy though thrives in good loamy soil that does not get too dry. Prefers a semi-shaded sheltered site. We have this currently available in a POT 4 & POT 2.5 containers. Ask for them at your retailer.